by O'Guinn, Thomas; Allen, Chris; Semenik, Richard J. Created by the continuous feedback of a "student-tested, faculty-approved" process, PROMO 2e delivers a visually appealing, succinct print component, tear-out review cards for students and instructors and a consistent online offering with CourseMate that includes an eBook in addition to a set of interactive digital tools all at a value-based price and proven to increase retention and outcomes. 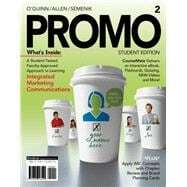 PROMO 2e is written in a concise style with plenty of real-world examples to illustrate the concepts of promotion and give students a glimpse into the industry and the challenges it faces.